Thanks to your monthly donations and support, 128 children are receiving three meals a day, clean water, shelter, education, clothing, medical attention, and regular biblical input. They are being rescued off the street and given the opportunity for a better life. We have witnessed first-hand the life-altering affects that your partnership makes. In fact, in the last few months, 5 new children have been added to Chanje Lakay and new children are being added to our other shelters as well. While at Zanfan Lakay on our August trip, Jimmy Bonhomme, who runs the shelter, took in 3 more children. These children were handed over during our feeding outreach at the Cathedral. It was a moment that many of the August mission team members will never forget. Although it was extremely heartbreaking to watch a mother hand over her child, because she literally did not have the means to provide, it was a beautiful representation of Christ taking us in when we have no way of providing for ourselves. He scoops us up in His arms and says, “You are mine.” Through your individual child sponsorships and Next Child sponsorships, children are hearing those very words. We are grateful for your support and prayers! This past August, Crossline Church, in partnership with the Chanje Movement and The Global Mission, had the opportunity to take 29 people to Haiti (our biggest team yet!) The week was nothing short of life changing. It started with a bang when the team, along with the music and choreography of Dean-o and the Dynamos, put on a two-day THBS (Total Haitian Bible Sensation) complete with crafts and teaching. Over 500 people were present and on the second day, 66 children stood up indicating a first time commitment to Christ. The team also put on a concert in the park and evangelized to locals on the street. Using the Four Spiritual Laws as a guide, they had the opportunity to pray with over 20 individuals who made the decision to receive Christ as their personal Lord and Savior for the first time! This was a huge answer to prayer and a powerful moment for everyone. As the week continued, the team had the opportunity to build deep and meaningful relationships with each of the kids at all three of our shelters. Each child was loved on and cared for. In addition, over 500 people had their tangible needs met through a public feeding in one of the most impoverished parts of the city. Finally, the team aided in the reconstruction of a home for key partners and friends, Pastor Petion and his wife Marjorie. Although construction on the house began in 2009 before the earthquake, without the funds and resources to complete the project, the couple and their family were left with nothing but half standing walls. As a team, we were able to lay the floor and provide a significant step toward finishing the project. It was a Spirit filled week full of transformation and growth. We know God still has more to do in Haiti, but as we build relationships and equip nationals with the tools to create change, we know that God will answer their prayers and restore their nation. We are thankful and blessed to watch God work and feel humbled that He has chosen us to be a part of the work He is doing. Over our four-year journey in Haiti we have had the privilege of meeting a variety of people with whom we partner. Most recently, we have extended our partnership with Jim Dieudonne (pictured below in blue). We met Jim a few years ago. 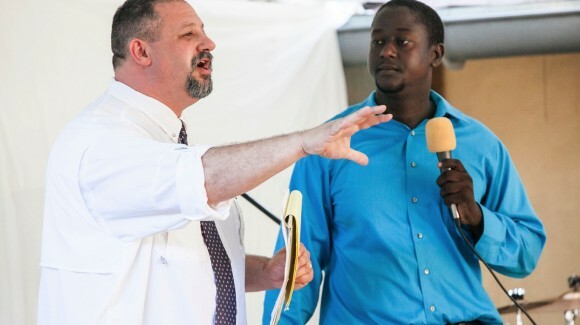 As one of our key translators on this past trip to Haiti, Jim has been a great resource and friend. He grew up in Croix des Bouquets, Haiti as the son of pastor. 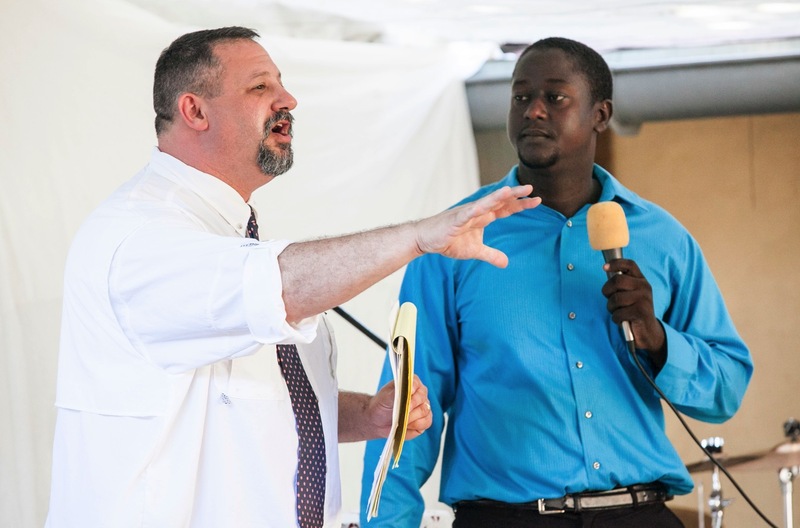 Although his family eventually moved to the United States and he lived in Fort Lauderdale as his father’s ministry grew, his heart and passion for Haiti never faded. When the earthquake struck in January of 2010 he decided to return to Haiti to help, and moved back to Croix des Bouquets indefinitely. He has one son and a child on the way. He and his wife also take care of a dozen children in his neighborhood. These are children who were homeless and formerly living on the streets. Jim and his wife have taken these children in and continue to provide them with basic needs, as well as show them Christ’s love. In addition, Jim is the foreman for a reconstruction crew, the same one that we worked alongside to lay the floor at Pastor Petion’s house, and helps our ministry with translation and outreach! November 9 – 16, Crossline Church and the Chanje Movement will be taking another team to Haiti. This trip is specifically designed for the men. A different focus is put on the trip in order to best use the skills, talents, and gifts brought through the team. Last year the men were able to visit the local prison in Croix des Bouquets. They spoke to the prisoners, prayed for their needs and evangelized and saw many come to know Christ. In addition to returning to the prison for outreach, the group of men will also host a pastor’s conference. This conference is geared towards raising up the local pastors in Haiti and equipping them with the necessary tools and resources to lead their congregations and impact their nation for Christ. The men will be feeding locals, evangelizing to those on the streets and doing service projects at each of our shelters. Members of the trip include Pastor JP Jones and other Crossline pastors as well. Keep this team in your prayers as they begin preparing for all God will do in and through them. We are so grateful for your partnership and prayers and we are committed to continue to share all of what God is doing in our ministry and in Haiti. Your monthly sponsorships are the financial means through which we are able to meet the needs of those who are in our care. However, partnership is more than merely financial. None of what we do would be possible without the tireless prayers of the faithful men and women who are committed to our cause. We love and serve a God who hears our prayers and cares for our needs. We pray with the expectation that God will do big things knowing that it is through Him that all of this is possible. Continue to pray for the restoration of Haiti. Pray for all of the children in each of our shelters. Pray that Christ would continue to be made known and the Holy Spirit would transform lives. Pray that financial needs are met and pray for wisdom from our leaders as they make decisions based on where they feel God leading. We are so grateful for your partnership and have faith that God will continue to do great things here and in Haiti!